Manila—(PHStocks)—Philippine stocks end slightly lower Wednesday, 17 July, as investors maintain a cautious stance ahead of the US Federal Reserve’s Ben Bernanke’s statements today. 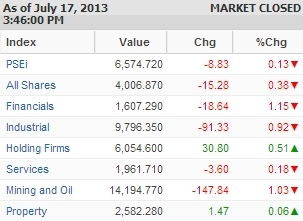 The mainboard Philippine Stock Exchange (PSE) index declined by 0.13% to close today’s trading at 6574.72. All counters except for the Holding Firms (+0.51%) and Property (+0.06%) indexes were down, with the Financials shedding the most at 1.15%. The Mining and Oil sector, meanwhile, lost 1.03%. The wider All Shares index, on the other hand, just lost 0.38%. Trading was slow, with value turnover reaching only PhP6.67 billion on 967 million shares traded. Foreign buying was PhP3.41 billion while foreign selling reached PhP3.59 billion. There were 50 gainers today against 97 losers, while 45 stocks were flat. Most active stocks include Ayala Land Inc. (ALI, PhP30.40, NC), San Miguel Corporation (SMC, PhP85, +1.49%), Metropolitan Bank & Trust Company (MBT, PhP109.70, -2.92%), Philippine Long Distance Telephone Co. (TEL, PhP2,886.00, -0.48%), Universal Robina Corporation (URC, PhP124.20, -0.24%), San Miguel Corporation Series “2” Preferred Shares – Subseries “2-A” (SMC2A, PhP74.70, -3.61%), Ayala Corp. (AC, PhP610.00, 1.16%), SM Investments Corporation (SM, PhP944.00, 2.61%), Bank of the Philippine Islands (BPI, PhP92.00, -0.43%), and Alliance Global Group Inc. (AGI, PhP24.60, -1.4%).